Chia Pudding is a wonderful (and portable) egg-free breakfast or snack idea. Here's how to make chia pudding and a recipe for a Strawberry Banana Chia Pudding Parfait! If you get sick of eggs for breakfast, or want something easy to put in the fridge and just grab and go in the morning, or want a different kind of snack that is portable and filling, chia pudding might be your answer. It doesn't require a ton of ingredients and you can make it as fancy schmancy as you want or as simple as you want. Some chia puddings take a few hours to really solidify and are best put in the fridge overnight, but my recipe below is one you can put together in under 20 minutes. What's different is the ratio of chia seeds to liquid – the less liquid, the faster the pudding will come together. Chia seeds are one of those things that have been around for a long long time (Aztec warriors used to eat them, and then I'm sure you probably made a chia pet at some point in time in your life, right?) but only recently became elevated to superfood status. Rich in Omega-3's, calcium, magnesium, potassium, fiber, protein, and antioxidants, they are little powerhouses of nutrition. Plus they do a pretty good job of making you feel full. They have a ton of other benefits too – which I'll link to in this article by Dr. Axe which I think sums it up quite nicely. But what exactly do you do with chia seeds? You can make chia jam, as a replacement for an egg in a baking recipe, sprinkled on salads or in a homemade granola, and our favorite thing – chia pudding. Because chia seeds absorb so much liquid (they can absorb up to 10x their weight in water! ), they gel really nicely. So if you add, say, coconut milk to the seeds, they turn into a nice little porridge. And that's exactly what you do to make chia pudding. Add liquid. You can add other things, like maple syrup or honey to sweeten it up, cocoa powder to make it chocolatey, bananas to make it creamy, almond butter to make it have a different flavor and more protein, etc. Or make it and THEN add tons of toppings like cocoa nibs, fresh berries, shredded coconut, granola, hemp seeds, goji berries- the sky is the limit with chia puddings! That's why I think we like them so much. It's hard to get sick of something you can customize so endlessly. 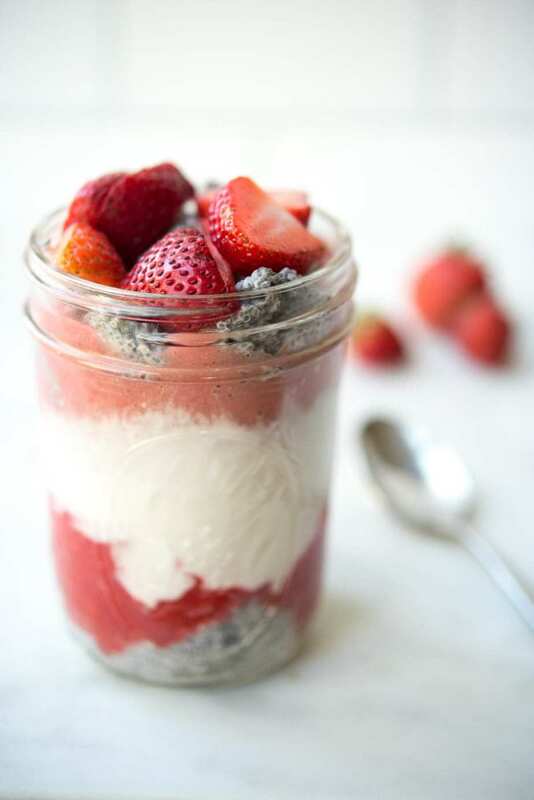 You can easily do a google search for chia pudding recipes to find ones if you don't feel comfortable experimenting on your own, but below I have a basic chia pudding recipe that has been made into a Strawberry Banana Chia Pudding Parfait. Paleo, gluten-free, dairy-free, and super easy to make – watch the video to see how easy – and great to make ahead of time and then just store in a glass Ball jar or pyrex and then take with you to work or wherever. Chia pudding is an easy-to-make snack or breakfast idea that's easily portable and can be customized with lots of different flavors. This recipe is for a strawberry banana chia pudding parfait. Mix chia seeds and coconut milk in a small bowl. (Note: If you have a can of coconut milk where the cream is separated from the water, mix first to get the milk smooth. Coconut milk is notoriously inconsistent in whether it’s liquid or separated like this, annoying!!) Refrigerate for 15 minutes. Meanwhile, cut the tops off all of the strawberries. Blend 2 cups of the strawberries in a blender until a smoothie-like consistency. Transfer the blended strawberries to a separate bowl and set aside. To the blender add the bananas and 1 cup strawberries. Blend these into a smoothie-like consistency. You may have to use your blender’s tamper to get the bananas to puree. In a pint-sized glass jar or a bowl, layer approx ¼ cup chia pudding, 1/2 of the strawberry puree, half a can of coconut cream, 1/2 of the strawberry banana puree, and then ¼ cup more of the chia pudding. Add some sliced strawberries on top. You could also add some Paleo granola, but do this right before serving (don’t do this and put in the fridge for a few days. Because, soggy granola). 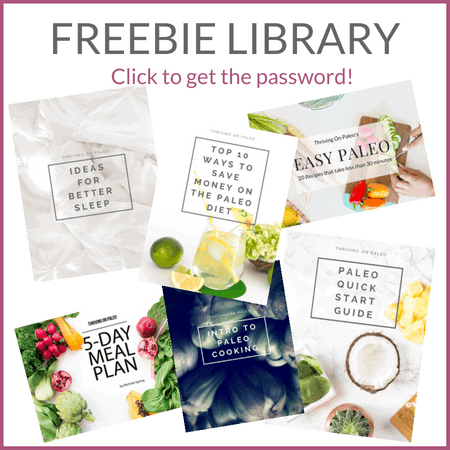 This recipe is a part of my free 5-day Paleo Meal Plan – grab your copy now! This looks like an awesome little snack or treat. I have never thought about layering chia pudding like this before. Love this parfait idea! I’ve been wanting a breakfast change up! This is just the ticket since I am still off eggs! Thank you! Yesssss, love chia seed puddings! Bananas and strawberries are such a classic magical combo. Yum! What a delicious treat! Can’t wait to try. I love how you made these into a parfait, we’re pretty addicted to chia puddings because they’re just so easy to make and of course – portable! I love chia seed pudding and this parfait is beautiful!! Perfect make ahead breakfast! I love the strawberry/banana combination and the layers are so pretty! Such a great breakfast that’s healthy! Chi-Chi-Chi-Chi-A!! I remember that commercial, though I never had a Chia Pet. 😉 Love Chia Pudding though so I need to make this one soon. The perfect breakfast or treat on the go, I’m going to make a double batch!! Another astounding chia seed recipe, an imaginative use too. Thank you! Love strawberry banana flavor combo! This is beautiful! Love those gorgeous strawberry layers!